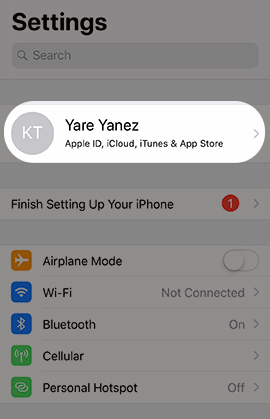 If the you are unable to access the device or it is unresponsive, Find My iPhone can be disabled online via iCloud. From the main settings screen, tap your name (at the top). If necessary, tap the left arrow (upper-left) as necessary to return to Settings. Tap the Find My iPhone switch to turn on o desactivar . If prompted, enter your Apple ID password then tap Turn Off. If desired, tap the Send Last Location switch to turn on or off.